It had been a long standing dream of mine to ride to Kanyakumari – the southern most tip of Indian peninsula where the 3 seas ( Arabian sea, India Ocean and Bay of Bengal) meet. In fact in its very basic form my current goal of covering India on a motorbike began with the idea of a long ride along the Indian coastline. And though I was unable to do that when I headed south and changed course midway to see my relatives, attend a few family get togethers I managed to make it to Kankyakumari. 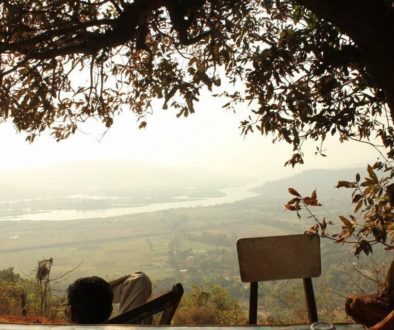 The destinations after Gokarna and Hampi were not as exciting and I was so disappointed (why??? in another post) that I had made up my mind to come back home midway through the trip. 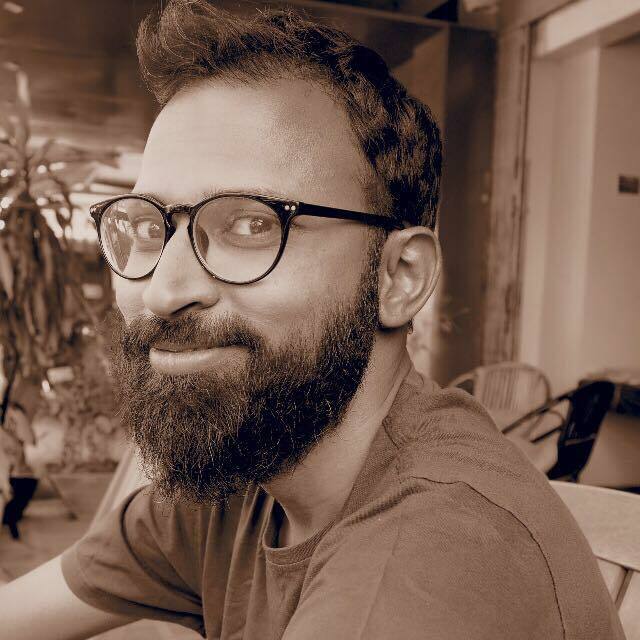 But then a bit of encouragement from a dear friend changed my mind and I decided to ride to Kanyakumari as my last destination on this leg of south trip and then head home. 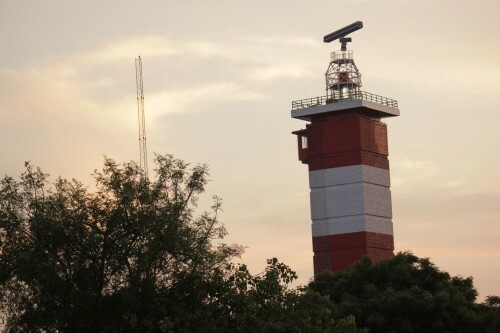 The first thing that you will observe as you head towards Kanyakumari is the windmills. The administration seems very enthusiastic about alternative forms of energy and that can be clearly seen the rows and rows of windmills that stretch up the to horizon. 'The Answer' is blowing in the wind! The one thing that I was excited about was that I would get to click a picture of ‘Beauty in Red near the tip, but unfortunately the traffic cops did not allow me to ride my bike beyond this square which leads to the shore where three seas meet. Another let down was that I was expecting to see that if one could make out each of of three seas, which if what I read and heard were to be believed was very evident in distinctly coloured water of Arabian Sea to the west, Indian Ocean to the south and Bay of Bengal to the east. But the sun was playing hide and seek behind the clouds and it seemed like a single water body. 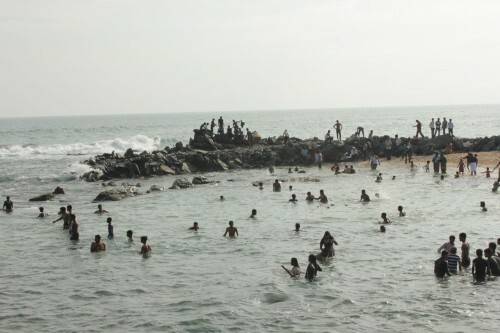 However that did not fade the enthusiasm of the the hordes of tourists that flocked this place and many of them taking a dip in the seas as they believe it to be very auspicious. There is lot of talk about the sunset and sunrise, but the sunset I could not view owing to the cloudy skies. So I just walked around clicking a few pictures here and there of a few important sites near the shore. 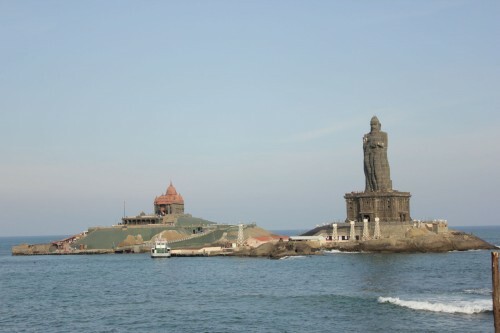 The first among them was that of the ‘cannot be missed’ Vivekanand Rock Memorial and 133 feet Thiruvallvur Statue standing right next to it. 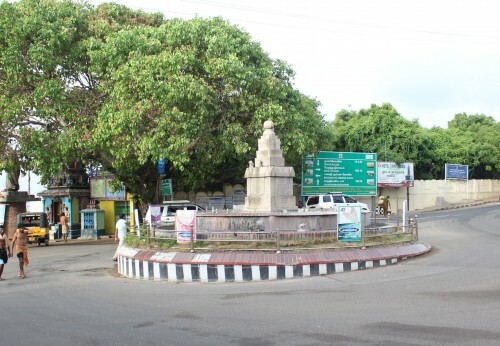 The Thiruvallvur statue is an imposing monument built in memory of the famous Tamil poet Thiruvallvur while the Vivekanand Rock memorial is the famous rock on which Swami Vivekananda sat and meditated achieving enlightenment that led to his becoming a reformer and philosopher post that incident. Gandhi memorial, overlooking the sea is another tourist attraction here. Built on the spot where the ashes of the Mahatma were kept for public viewing and before immersion it is designed in such a way that on 02 October – the birthdate of the Father of the Nation , the first rays of sun fall exactly at the same spot where the ashes were kept. Having been unable to see the much talked about sunset, I decided to make it a point to wake up early and the next day to catch the sunrise and was hoping there would not be much crowds since its pretty early in the morning. But how mistaken I was I realized as soon as I got out of my hotel. Not just crowds an entire market selling everything from coffee for the early wakers to shells and saris was up and doing brisk business. And the sun stayed hidden behind the clouds as it rose and there was a really light drizzle as well. So I got into a small hotel and got myself an early breakfast And breakfast as is everywhere in most of the hotels in Tamilnadu was served on a plantain leaf. If there is one thing about Tamilnadu that I miss, then that the food that is always served in a plantain leaf in each and every restaurant. 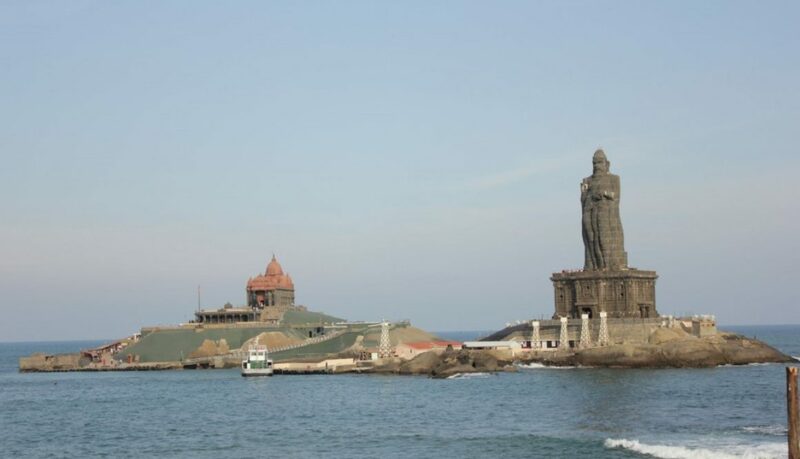 I spent the rest of the morning visiting the Vivekanand Rock memorial for which one has to take a ferry managed by a state owned shipping company and I would say that despite the crowds it was one of the quietest places in Kanyakumari that can be. 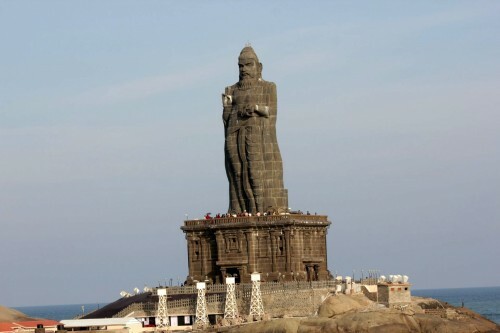 And that was my two day trip to Kanyakumari. I would like to come here some time when there are now crowds but talking to the locals out there they said that there is not time when there are no crowds here. Does that mean I won’t come here again? Hell no! I would come back for just one thing. Right across my hotel the light house and in the evenings when there was a power cut and it was pitch dark, and the light from the light house would keep on revolving, it was a sight to just lie down, gaze at the stars and relax. 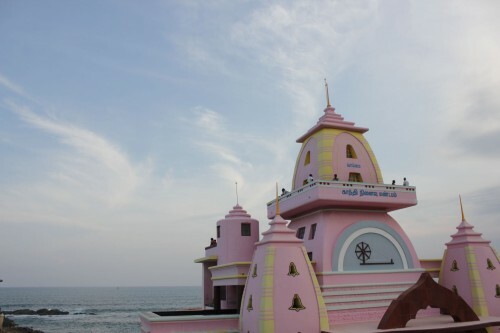 And that one reason is good enough for me to get me back to Kanyakumari despite the heat, the sweat and the crowds.